22nd December, K.Lumpur: It was a double joy for Malaysia as Sin Li Jane and Muhd Rafiq Ismail captured both the Girl's and Boy's Open Masters titles of the 13th MILO International All-Stars while Natasha Roslan of Selangor bagged the Masters crown. 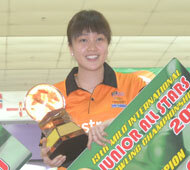 Asian Championships Singles gold medalist, Li Jane easily defeated challenger and No. 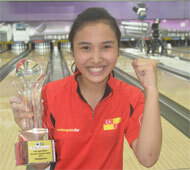 2 seed, Joey Yeo of Singapore, 257-193 to win the Girl's Open title for the second time. The 20-year-old top seed first took the title in 2008. "I'm so happy to win this title to cap off a good year," said the 20-year-old Li Jane country to pick up the Bent Pertersen Trophy after her team-mate, Syafiq Ridhwan won the men's crown. Yeo had earlier dispatched two Malaysian opponents, No. 3 seed, Hee Kar Yen of Malaysia and defending champion, Dayang Khairuniza, 213-189-185 to face Li Jane. The champion earned top seed for the stepladder finals after totaling 2280 in the yesterday's 10-games finals ahead of Yeo in second with 2268. Hee and Dayang made the stepladder finals in third and fourth with 2265 and 2231 respectively. Meanwhile, last year's runner-up, Muhd Rafiq Ismail, who was determined not to let his chance slip up again this time, edged challenger and No. 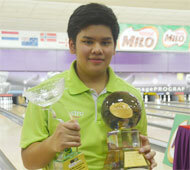 3 seed, Danish Ramlan of Singapore 235-231 to win the Boy's title. "I was more relaxed this time round," said the 15-year-old member of the Malaysian Special Youth squad, Muhd Rafiq. "I was happy to reach the finals again but I didn;t want a repeat of last year's finals. I didn't want to lose. Danish earned a crack at the title after rolling a big game to beat No. 2 seed Muhd Aizudeen Mustaqim of Selangor and No 4 seed, Sam Cooly of Australia, 261-224-223 but his fine run ended with defeat to Muhd Rafiq. The champion made the stepladder finals in pole position with 2575 followed by Aizudeen in second with 2485. Danish and Cooly made the finals in third and fourth with 2435 and 2425. Asian Championship Masters gold medalist, Lim Dong Sung missed the cut in fifth by 16 pins. Muhd Rafiq won the top prize of RM25,000 (approx. US$8,100) with Danish and Aizudeen earning RM15,000 and RM8,000 (approx. US$4,900 and US$2,600). Sin Li Jane picked up RM18,000 (approx. US$5,800) as champion. It was an unexpected results in The Masters after the 16-year-old Natasha Roslan of Selangor put up a terrific performance to win her first international crown. The top seed bounced back with a 263-233 deciding match against Singapore's Vincent Lim after losing the first match, 226-263. "Obviously I'm bery happy ... I'm really, really happy," said Natasha. "It was a tough match against so many good bowlers. I finished 13th in the Girl's Open finals and I was determined to do better in The Masters. The Singaporean advanced to face Natasha after beating two national elite squad members, No. 2 seed, Zulmazran Zulkifli and Hong Kong Open and Daejeon Open champion, Esther Cheah, 253-193-244 in the second match. Cheah took the first stepladder match with victory over No. 4 seed, Siti Shazwani and No. 5 seed, Muhd Nur Aiman, 264-225-207 to advance into the second match. Natasha completed the earlier finals with 2521 thanks to a 15 pins handicap she received for each game. Zulmazran and Vincent Lim finished second and third with 2459 and 2452. Siti Shazwani, Muhd Nur Aiman and Esther Cheah made the stepladder finals fourth to sixth position. Natasha came off with a big prize of RM35,000 (approx. US$11,400) as champion with Lim taking home RM20,000 (approx. US$6,500). Zulmazran, Siti, Aiman and Cheah earned RM10,000, RM8,000, RM6,000 and RM4,000 respectively.